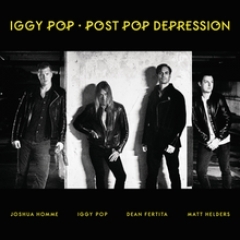 Now, I won’t say I’ve heard every album Iggy Pop’s ever made – he’s made an incredible amount of solo records between his departure from and return to The Stooges (1974 and 2003, respectively) – but one thing is for certain: ”Post Pop Depression” is a hell of a return to his classic 70s-era. The album was recorded secretly at Rancho De La Luna studio in Joshua Tree, California, by producer and primus motor of Queens of the Stone Age, Joshua Homme, who also contributes on the record with guitar, bass, et cetera. 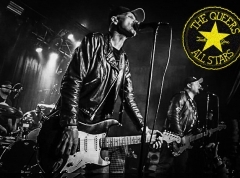 The end-product is an album which sounds as dusty as the upholstery of Iggy’s own throat, yet also is as smooth sailing as QOTSA’s last album, “…Like Clockwork”. Not surprisingly, the two icons make an excellent match. The album kicks off with Iggy Pop’s signature vocals crooning over some heavy and abrasive synthesizers which bring you back to the krautrock of his 1977 masterpiece, “The Idiot”. ”I’m gonna break into your heart // I’m gonna crawl under your skin” he sings, as the guitar and synths come crawling towards you. By the middle of the song, a piano joins in and adds a few sporadic and spontaneous keys that give the song a little soul. Already by now, Iggy Pop feels as relentless and feral as he’s ever been. His companions – who, beside the aforementioned Joshua Homme, consist of drummer Matt Helders (of Arctic Monkeys) and guitarist Dean Fertita (another member of QOTSA) – seem to have somehow revitalized the old dog. Next up is “Gardenia”, the second song on “Post Pop Depression”. It’s definitely the best song on the album, and it features a gorgeous chorus: ”All I want to do is tell Gardenia // What to do tonight”. The lyrics are not only about Pop’s sexual desires, but also about his own status: Alone in the cheapo motel // On the highway to hell // America’s greatest living poet // Was ogling you all night”. It’s quite a statement to make, but after the death of David Bowie, who’s left to question him? He does, however, face his own mortality in the song “American Valhalla” where he sings ”Where is American Valhalla? // Death is the pill that’s hard to swallow” and admits that he’s got nothing left but his name. Iggy Pop might still be making high claims, but he can’t help but ponder about when his own time is up. Throughout, the album is an interesting listen. Sure, it’s not every song that’s as good as the aforementioned (“In the Lobby” is a slight decline), but most of them offer something new. “Vulture” is as creeping and disgusting as the title suggests, featuring chanting in the back and a mellotron that helps create ominous soundscapes. However, the real kicker on the second half of the record is the album-closer, “Paraguay”. It starts with about 30 seconds of harmonizing vocals and then turns into the actual song. It’s easy going, it features a nice, slow and steady rhythm section, a piano which happily trots along, and a thick guitar riff that scratches just beneath the surface. But then, after three minutes and eleven seconds, the bass and drums get noticeably heavier and change the pace of the song. The harmonizing vocals from the first part return, and Joshua Homme’s guitar starts playing and directs the entire instrumental section into a jam-session containing some incredible guitar riffs and enormous drum fills. In the back, Iggy Pop fully unleashes his inner dog, barking and biting everyone who comes near him, leading up to an abrupt end. On “Post Pop Depression”, Iggy Pop might not touch the uniqueness of “Fun House” or “The Idiot”, but it’s a damn strong testament to his legacy. Revitalization from other band members or not, it’s beautiful to hear a man this far into his career release such a strong record. 47 years ago, Iggy Pop wanted to be your dog. Today, he’s the one putting you on a leash and dragging you across the dirty floor. Iggy’s in control, and damn us for ever thinking he’d loosened his grip.